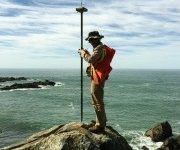 Find Out About Our Land Surveying Services | Adobe Associates, Inc.
At Adobe, we don’t just survey your land like some other firms; we take the time to understand what you need. Inadequate surveying can cost you time, money, and create costly roadblocks later in your project. You’ll find that one of our greatest strengths is that we provide you with a full, honest project scope, up front, so we can help to meet your ultimate goals. If you’re interested in a land surveying company that goes the extra mile in everything we do, then you’re ready for Adobe Associates. 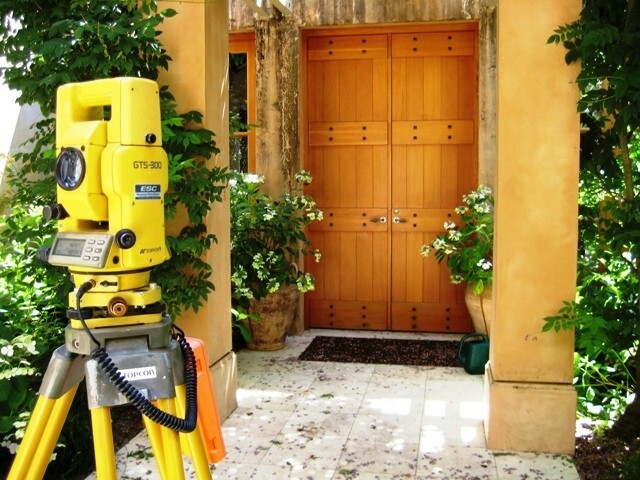 To give you the best possible services, our land surveyors stay current. 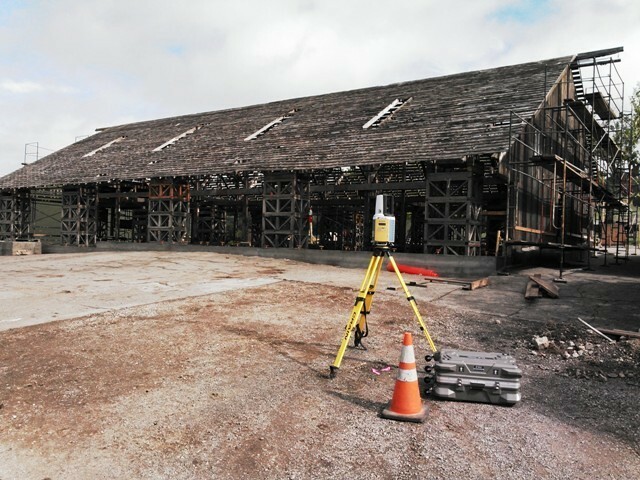 That means we utilize the latest equipment and technologies to improve proficiency and to provide you with more accurate, consistent and reliable land surveying results. We also stay up on all of the local ordinances and policies so that we can minimize project delays. 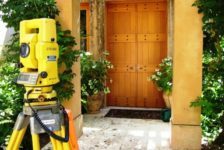 Boundary Surveys - We identify and map the perimeter boundaries of parcels of real property which may require the setting of permanent or semi-permanent "monuments" to mark the corners of the property. Construction Surveys - We calculate and mark on the ground where, both horizontally and vertically, specific design elements are to be placed and constructed. Development Surveys - These surveys are used for applications for the division of real property into parcels/lots, subdivisions, condominiums, mobile home parks,etc., in urban or rural jurisdictions. 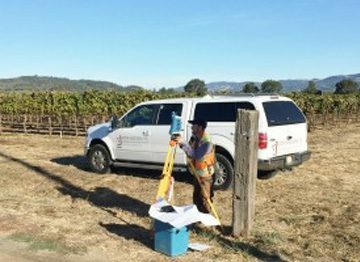 We can also handle coordinating other land surveying services such as contact with PG&E, architects, soil engineers, contractors, vineyard management companies and other project partners. You’ll find that our superior communication and coordination experience makes a big difference in the quality and efficiency of your project. Topographic Surveys are used to identify and map the contours of the ground and existing features on the surface of the earth, slightly above, or below the earth's surface (i.e. trees, buildings, streets, walkways, manholes, utility poles, retaining walls, etc.). If the purpose of the survey is to serve as a base map for the design of a residence or building of some type, or design a road or driveway, it may be necessary to show perimeter boundary lines and the lines of easements on or crossing the property being surveyed, in order for a designer to accurately show zoning and other agency required setbacks. 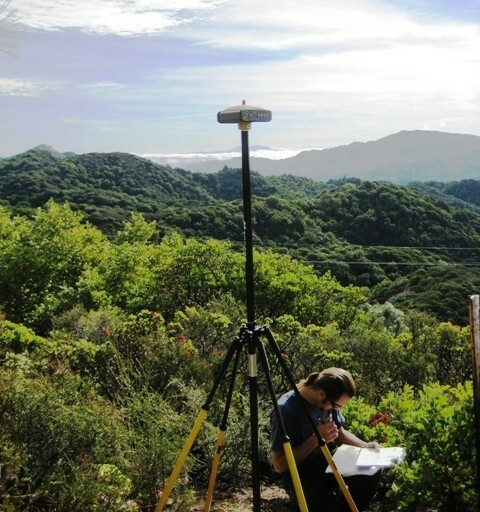 Topographic Surveys require "bench marks" to which ground contours are related, information regarding surface and underground utilities, determination of required setbacks, etc. Boundary Surveys identify and map the perimeter boundaries parcels of real property which will perhaps require the setting of permanent or semi-permanent "monuments" to mark the corners of the property being surveyed. The difference between boundary and title lines may need to be a part of the work in that identification. Boundary Surveys require researching existing recorded (and sometimes unrecorded) survey maps and title documents (deeds, title reports, agreements, etc. ), identification of encroachments either way across boundary lines, evidence of occupation of properties adjacent to the parcel being surveyed, evidence of easements or usages that may or may not have been recorded, etc. A Lot Line Adjustment (LLA) is an adjustment of a line or lines between legal parcels. The first step is to make sure we have two legal parcels that can be adjusted and have the potential for development. 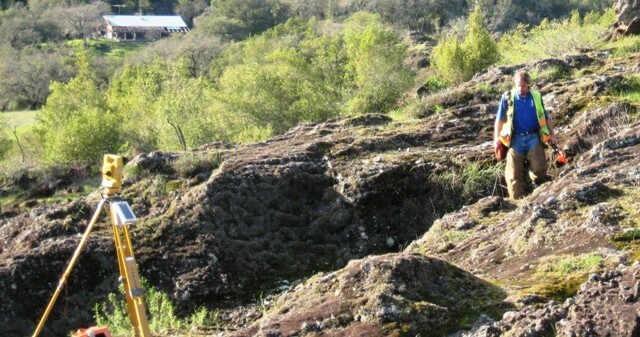 Sonoma County, as well as most counties and cities, has requirements and an ordinance that governs the process of a LLA. The process generally requires an application package prepared by a professional and submitted to the County or City for review with the appropriate filing fees. This package generally requires the current Deeds for each parcel, a Title Report for each parcel, Assessor's Parcel Map, Project Proposal Statement describing the adjustment and why, a USGS Quad Map, and a Site Map. The Site Map needs to reflect both parcels and the improvements on each one of them with the existing boundary lines, easements, and the proposed boundary line(s). Existing improvements include wells, buildings, driveways, utility poles, septic fields, and other significant improvements. 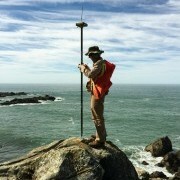 The Site Map will require a field survey to identify these items and sometimes, but rarely, imagery can be used to supplement in areas that are not in close proximity to boundary lines or the area of adjustment. Once the Lot Line Adjustment package is submitted the jurisdiction will review it and either deem it complete and conditionally approved, or incomplete and provide you with what needs to be added, or deny it with reason. If it is conditionally approved, they will provide a list of items that need to be completed before recording the new deeds. Such as, pay all property taxes, prepare legal descriptions and plats of the areas of adjustment, and make sure all lien holders sign off on partial reconveyances. These are some of the items that will be required, but certainly not an all-inclusive list. Lot Line Adjustments are not required to be monumented. However, a Professional Land Surveyor can set monuments at the new corners but would then be obligated to file a Record of Survey with the County identifying the monuments that were set. A map must be prepared, reviewed, and subsequently recorded with the County in which the LLA was done. This is a brief overview and does not detail all situations or regulations in all jurisdictions but a fair sampling of what we have experienced doing Lot Line Adjustments in many jurisdictions in Northern California. As defined in the Subdivision Map Act, a subdivision is the division of land for the purpose of sale, lease or finance. In general, a minor subdivision creates four or fewer new parcels and concludes with the recordation of a parcel map, while a major subdivision creates five or more parcels and concludes with the recordation of a final map. While these distinctions alone are simple, the efforts necessary to accomplish each are very different. Both parcel maps and final maps follow a similar process of approval and recordation. A preliminary form of the map will receive conditional approval, from which it can be advanced to its achieving its recordable form in exchange for satisfying specific requirements. For both maps, the process of achieving the conditional approval requires public hearing, compliance with the California Environmental Quality Act (CEQA), and referral to any public agency potentially affected by the subdivision. 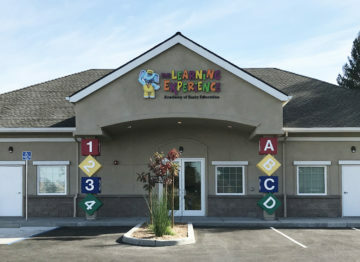 The specific requirements handed down to the project are known as Conditions of Approval (COA's) , which are typically satisfied with the preparation of construction documents , a parcel map or final map, the posting of bonds and the remittance of fees , and the execution of a subdivision improvement agreement. 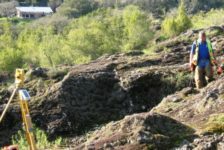 In Sonoma County, this process typically takes two years for a parcel map, while it is not uncommon for a final map to take a longer period of time, depending on the nature of the project. In summary, a minor subdivision creates four or fewer parcels and can be achieve recordation in about two years, and a major subdivision creates five or more parcels and can take a number of years to reach recordation. The simple answer is an Aerial Survey is one that is conducted partially from the air to collect information. This is much of the time done by aerial photography from an airplane or helicopter. 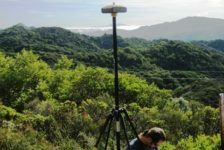 When there is a need for topographic mapping of a large area, a cost effective way to obtain information and collect data is an Aerial Survey. 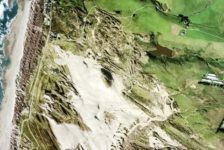 A series of aerial photographs, or digital images, are taken and then put together to form a three dimensional model of the land. From this three dimensional model topographic information such as contours, buildings, lakes and ponds can be extracted. In addition a color picture that can be overlaid onto that topographic map can be made. This process is called a digital orthophoto and is different from a standard photo in that it is at true scale anywhere on the photo. 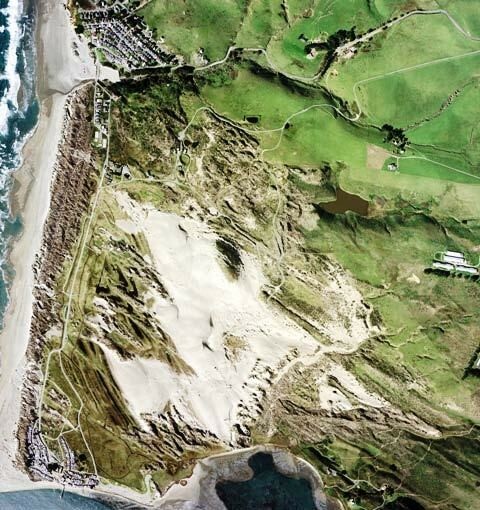 An Aerial Survey is a great tool for developing large or hard to access sites. The advantage to an Aerial Survey is that it is not necessary to physically walk the entire project site to gather information. However, the Aerial Survey does require "targets" to be set and a ground control network tied together that can be seen from the air. If there is dense tree cover you can't see the ground to determine contour information; likewise if there is dense brush or even tall grass, the contours may reflect the top of the brush or grass, not the ground. 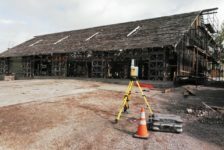 Many times an Aerial Survey of the overall site may be combined with traditional topographic surveys of specific areas to achieve a design grade product to be used by architects and engineers.